A novel physical-statistical channel model for simulating the signal effect by moving human bodies is presented. The human body is modeled as vertically oriented dielectric cylindrical volume. The received signal is assumed to be composed of a direct component which might be subject to shadowing and a multipath component due to reflection and diffuse scattering, i.e., a Ricean channel. The shadowing effect of the direct signal component is calculated using Kirchhoff diffraction equation. The multipath component is parameterized by calculating the reflected fields from the floor, ceiling and walls of the indoor environment as well as scattered fields from moving human bodies. Poisson and Exponential distributions are used to describe the shadowing and inter-shadowing events caused by multiple bodies, respectively. Furthermore, simulation results of the first and second order statistics of the received signal affected by moving human bodies for 3.35 GHz and 60 GHz signals are presented. In addition, initial validation of the developed model are performed using an empirical model for human body shadowing and reported measurement results. Wireless communication systems are subject to different propagation impairments, among them are signal shadowing by moving human bodies. For wireless systems operating in indoor environments, human body shadowing is a significant propagation impairment. Unlike to outdoor cellular systems, the transmission power and the height of base-stations is much lower in indoor environments. 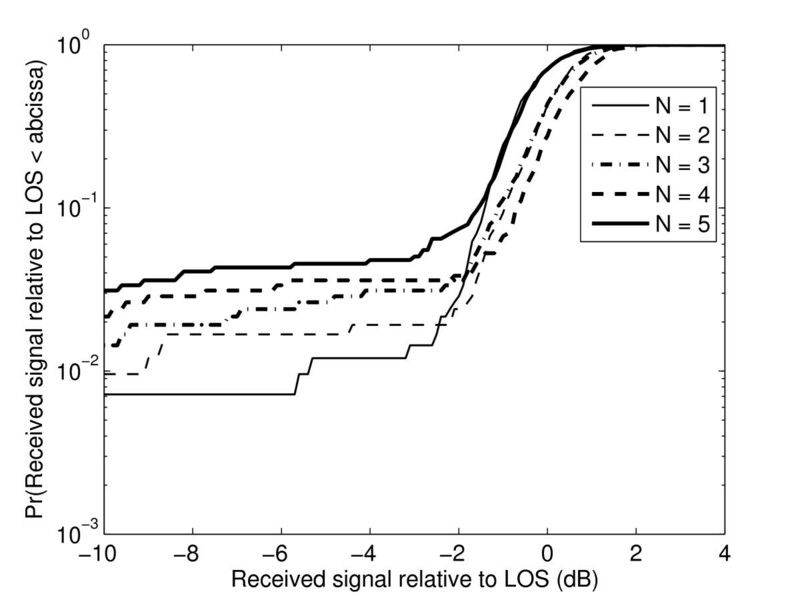 Thus, the signal loss by body shadowing greatly affects the received signal strength. Furthermore, giving a fixed location of the transmitting and receiving antennas, the random movement of people may cause a time varying channel conditions. A path-shadowing model for indoor environment using Markov process is reported in . In [2, 3], numerical examination of electromagnetic wave shadowing by human body using method-of-moment (MoM) solutions are presented. 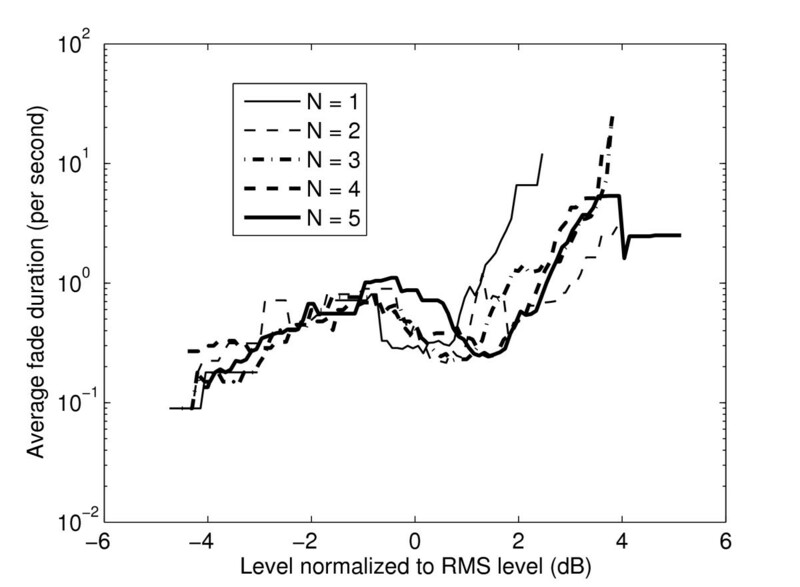 A two-state Ricean model for predicting the indoor wireless channel was reported in . An empirical model for describing the large-scale fading pattern of the signal affected by the human body was presented in . 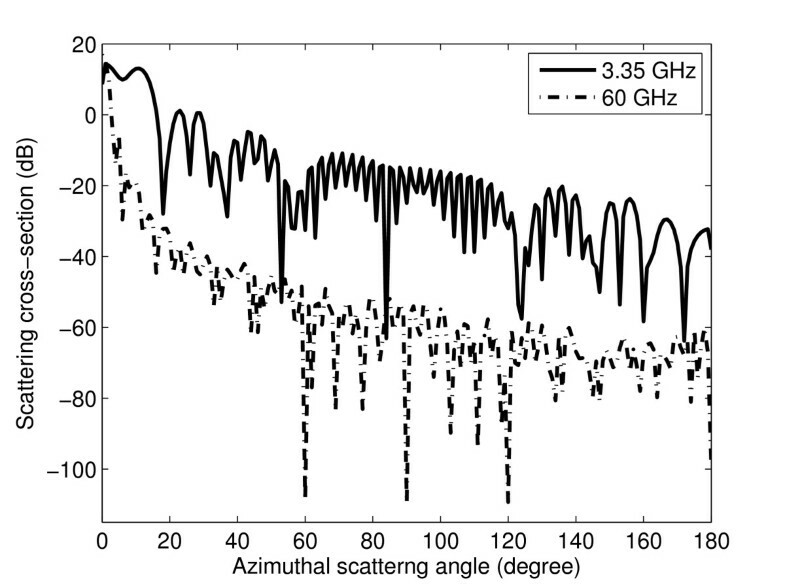 Furthermore, reference  presents propagation measurement results in the presence of human activity for a 60 GHz channel. In , the effect of human body shadowing on the multiple-input-multiple-output (MIMO) channel performance were investigated. 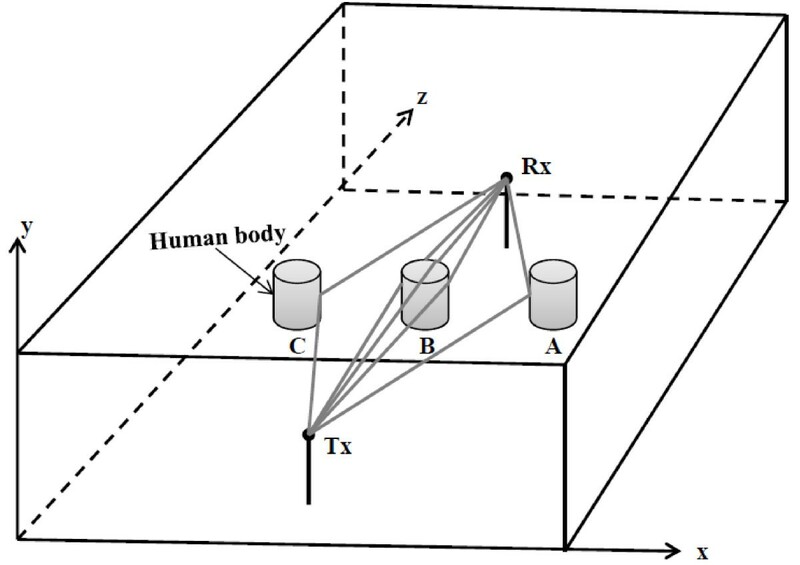 In this article, we propose a physical-statistical channel model for signal effect by moving human bodies. Physical-statistical models are more effective for simulating large scenarios compared to complex physical models, and more accurate than merely empirical or statistical models as they take into account the geometry of the link, and rely on physical (electromagnetic based) methods for calculating the needed model parameters. The received signal is assumed to be composed of a direct component which might be subject to shadowing and a multipath component due to diffuse scattering, i.e., a Ricean channel. The direct signal component is subject to shadowing effects, and is calculated using Kirchhoff diffraction equation. The multipath component is parameterized by calculating the reflected fields from the floor, ceiling and walls of the indoor environment as well as scattered fields from moving human bodies which are modeled as finite dielectric cylinders. The parameters of the Rice distribution change as the people represented in terms of simple volumetric forms walks through the propagation environment. Furthermore, Poisson and Exponential distributions are used to describe the shadowing and inter-shadowing events caused by multiple bodies, respectively. The article begins in Section 2 by identifying the main propagation mechanisms for moving human body effects in indoor environment, and presents the developed physical-statistical channel model. Simulation results and discussions are given in Section 3. Initial validation of the proposed model using an empirical model for human body shadowing and reported measurement results are shown in Section 4. Finally, conclusions are presented in Section 5. The considered propagation scenario is shown in Figure 1. The indoor propagation environment is defined by orthonormal vectors x, y, and z of a rectangular coordinate system. The human body is modeled as a finite lossy dielectric cylinder and is walking in the direction ABC or CBA crossing the line-of-sight (LOS) path between the transmitter (Tx) and the receiver (Rx) at position B. The positions of the transmitting and receiving antennas are fixed. Propagation scenario for signal shadowing by moving human body in indoor environment. The indoor propagation environment is defined by orthonormal vectors x, y and z of a rectangular coordinate system. The person is walking in the direction ABC or CBA. The LOS path is crossed at position B. Tx and Rx are the transmitting and receiving antennas, respectively. In addition to the reflection of the signal by the floor, ceiling and walls of the indoor environment (reflections from furniture and other objects are not considered), the signal is also scattered by moving human body at, e.g., position A and C (see Figure 1). As the person approaches position B, the signal is subject to both scattering and diffraction from the top and side of the human body. Note that the strength of the scattered and diffracted signals are position dependent and change as the person walks though the propagation environment. Furthermore, the random movement of people create time varying channel conditions. Characterization of the Doppler spectra is thus important for the determination of the time variance of the wireless channel. Other important parameters are the shadowing and inter-shadowing intervals which are needed when simulating the crossing of the LOS path by multiple bodies. In subsequent sections, we discuss each of the aforementioned propagation mechanisms for signal effect by moving human bodies. where P t is the transmitted power, G t and G r are transmitting and receiving antenna gains, respectively. Parameter L p is the path lose and L r = |R|2 is the reflection lose with R = R P , R N .
Human body model. x, y and z are the orthonormal vectors of rectangular coordinate system. R and H are the radius and height of the human body. k i and k s are the incident and scattered propagation vectors. θ i and ϕ i are the elevation and azimuth directions of the incident field. θ s and ϕ s are the elevation and azimuth directions of the scattered field. where angles θ i and ϕ i are the elevation and azimuth directions of the incident field. Angles θ s and ϕ s are the elevation and azimuth directions of the scattered field. For the propagation scenario shown in Figure 1, at each location of the human body, the incident and scattering angles can be calculated using geometrical relations, and these can be used further to determine the scattered signal utilizing the scattering cross-section defined in Equation (6). The multipath (fast fading) component of the Rice channel in indoor environment might then be described by the sum of the standard deviations of the reflected and scattered fields, σreflected + σscattered. Together with the direct signal component (discussed in Section 2.2), these are used in Section 2.5 to generate the signal fading caused by moving human body. Model for signal diffraction by the human body. Parameters Σ1, Σ2, and Σ3 are surfaces of the aperture. Parameter O is the intersection point of the Tx-Rx straight line with the human body. where a and b are the distances from the transmitter and the receiver to the aperture plane. The total received diffracted field is then the combination of the three aperture diffracted fields whose surfaces are Σ1, Σ2, and Σ3 with assumed infinite depth. Unlike simple ray tracing and Markov process models, the transitions between LOS and non-line-of-sight (NLOS) conditions are not sharp and thus more realistic regarding the empirical results. Using this model, good estimation of the shadow region behind a human body might be obtained. The standard deviation of the diffracted field, σdiffracted, is used to describe the direct (slow fading) component of the received signal affected by moving human body. Together with the multipath signal component (discussed in Section 2.1), σdiffracted is used in Section 2.5 to generate the signal fading caused by moving human body. The random movement of people in the propagation environment create time varying channel conditions. Characterization of the Doppler spectra is thus important for the determination of the time variance of the wireless channel. The situation where the antenna is moving in a random environment leads to the classical Jakes spectrum (with bathtub like shape) for scatters uniformly distributed in azimuth . For the case where the antenna is stationary, moving scatterers in the channel such as vehicles (in outdoor environment) or persons (in indoor environment) will lead to a different Doppler spectrum which peaks at 0 Hz and falls off rapidly [13, 14]. where e is a model constant with value equal to 0.02 chosen to much the measured Doppler spectrum . where N ^ is the average number of bodies crossing the LOS path. Equation (12) gives the probability that N persons cross the LOS path within a given period of time. where T is the time interval to the next shadowing event. Equation (13) gives the probability of T time interval for the next crossing of the LOS path. Parameter N ^ depends on the type of the environment, i.e., indoor (office, home, airport terminal, etc.) or outdoor (urban, suburban, rural, etc. ), and should be characterized using measurements for the considered propagation environment. 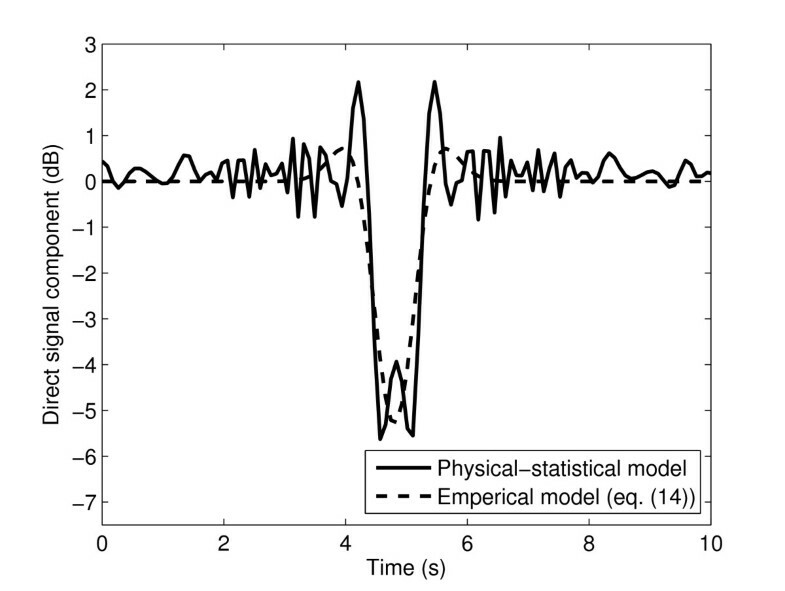 The proposed physical-statistical channel model for simulating the signal effect by moving human body is shown in Figure 4. In the model, a complex white Gaussian processes with zero mean and unit variance is filtered by Equation (10) or Equation (11) for Doppler spectrum shaping. The resulting time series are multiplied by the sum of the standard deviations of the reflected and scattered fields, σreflected + σscattered (see Section 2.1) to produce the multipath (fast fading) component of the received signal. Then, the standard deviation of the diffracted field, σdiffracted (see Section 2.2) representing the direct (slow fading) signal component, is added to produce the total complex signal envelope of the received signal affected by moving human body. Channel simulator for the signal effect by moving human body. A complex white Gaussian processes with zero mean and unit variance is filtered by S(f) (defined in Equation (10) or Equation (11)) for Doppler spectrum shaping. Parameters σreflected, σscattered and σdiffracted are the standard deviations of the reflected, scattered and diffracted fields, respectively. This results in physical-statistical modeling of the propagation channel where the received signal envelope is Rice distributed with its position dependent parameters calculated using electromagnetic based methods (i.e., reflection, scattering, and diffraction). Note that parameters σscattered and σdiffracted are position dependent, and change as the person walks through the propagation environment. Furthermore, Poisson and Exponential distributions are used to generate the shadowing and inter-shadowing events which can be used to simulate the crossing of the LOS component by multiple moving human bodies (see Section 2.4). The scattering cross-section of a dielectric cylinder representing a human body for a vertically polarized signal at 3.35 GHz and 60 GHz is shown in Figure 5. Isotropic antennas are used at the transmitter and receiver. The simulation parameters are given in Table 1. The field is incident from direction ϕ i = 180°, so the forward scattering direction is ϕ s = 0°. We can observe that the forward lobe of the scattering pattern becomes narrower with decreasing background as the frequency increases. This results in decreasing the received scattered fields in directions other than the forward direction. Scattering cross-section of a dielectric cylinder representing a human body at 3.35 GHz and 60 GHz. The simulation parameters are given in Table 1. An example of simulated time series at 3.35 GHz and 60 GHz using the developed physical-statistical channel model for multiple body crossing of the LOS path is shown in Figure 6. As expected we can observe that the signal attenuation by the human body increases with increasing frequency. We can also observe that the LOS path is crossed by three persons at around 5, 12, and 17 seconds with each shadowing event having a duration of around 1.5 s. Note that the duration of each shadowing event depends on the walking speed and diameter of the human body, and my vary from person to person. Knowledge on the duration of shadowing events is important for designing fade mitigation techniques (FMTs) such as adaptive coding and modulation. Usually there is no prior knowledge of the walking speed, v, and radius, R, of the people crossing the LOS path in a given environment. One way is to use an average values of v and R as done in our simulations. A different approach might be to generate random values of v and R for each body crossing the LOS path from statistical distributions. In this case, statistical knowledge of v and R are required. Simulated time series of the received signal effect by the human bodies at 3.35 GHz and 60 GHz. The simulation parameters are given in Table 1. 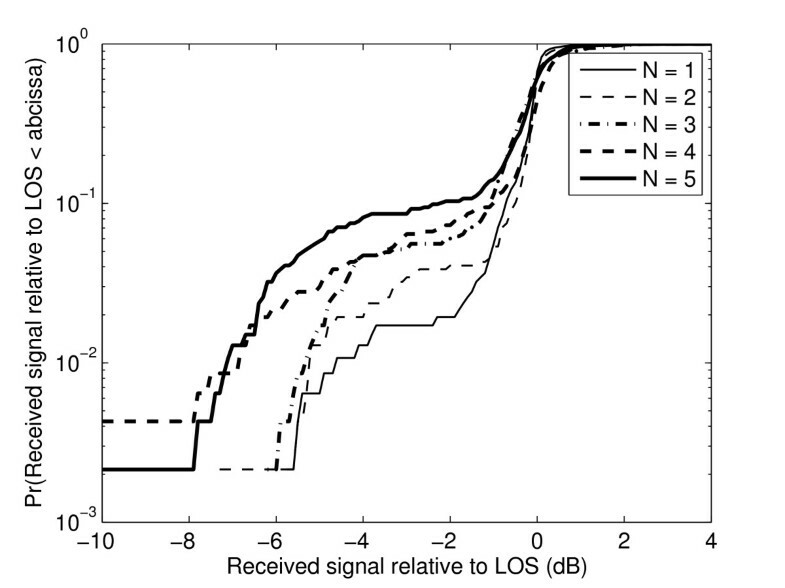 Figures 7, 8, and 9 show the simulated cumulative distribution functions (CDFs), level crossing rates (LCRs) and average fade durations (AFDs) of the received signal at 3.35 GHz affected by multiple bodies (N = 1, 2, ..., 5 persons). 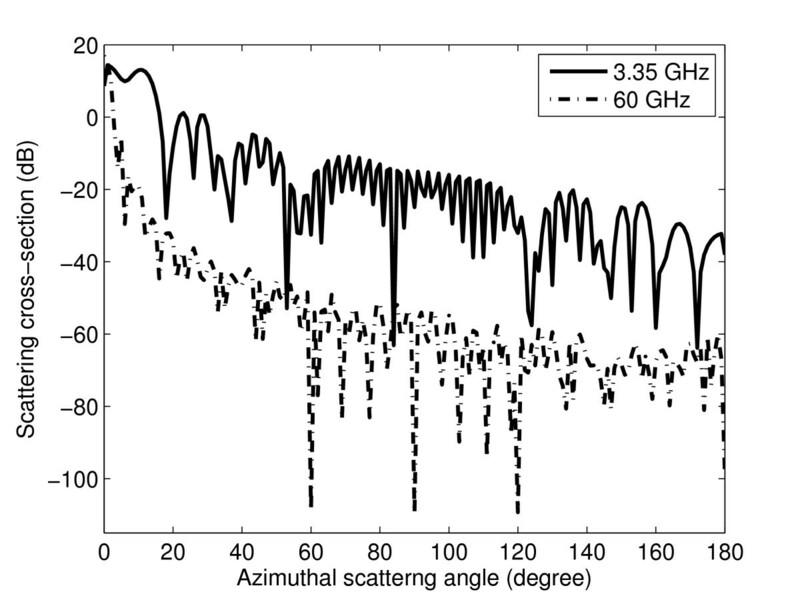 The same is shown in Figures 10, 11, and 12 for 60 GHz signal. Again we can observe that as the frequency increases the effect of moving human bodies on the first and second order statistics of the channel increases. Generally, as the frequency increases the wavelength decreases and thus small change of the path length may result in fast variations of the channel. From Figures 7 and 10 we can see that as the number of pedestrians increase (for N = 1, 2, ..., 5), the slope of the CDFs of the received signal decreases proportionally. Similarly, as the number of pedestrians increase, the LCRs and AFDs of the received signal increases, see Figures 8, 9, 11, and 12. These results are consistent with the measurement results of human body effects reported in . Simulated CDFs of the received signal effect by multiple human bodies ( N = 1, 2,..., 5) at 3.35 GHz. The simulation parameters are given in Table 1. Simulated LCRs of the received signal effect by multiple human bodies ( N = 1, 2,..., 5) at 3.35 GHz. The simulation parameters are given in Table 1. Simulated AFD of the received signal effect by multiple human bodies (N = 1, 2,..., 5) at 3.35 GHz. The simulation parameters are given in Table 1. Simulated CDFs of the received signal effect by multiple human bodies (N = 1, 2,..., 5) at 60 GHz. The simulation parameters are given in Table 1. 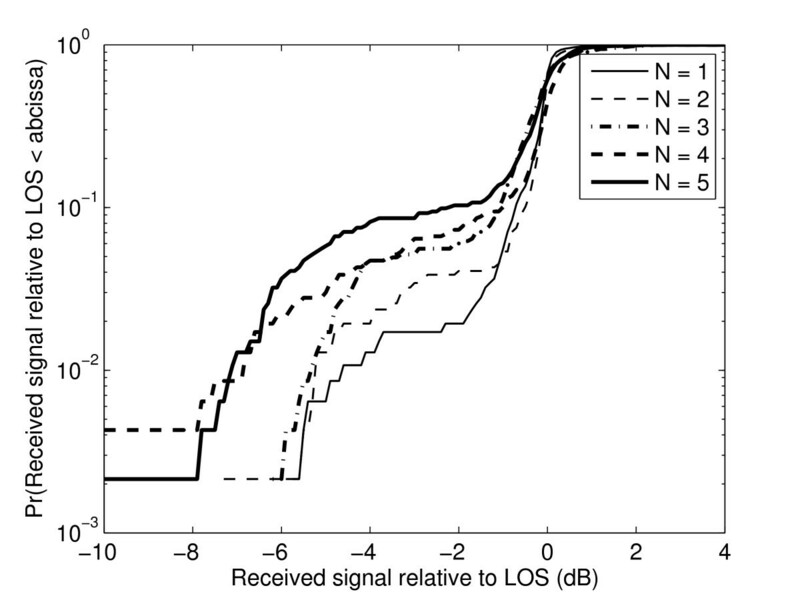 Simulated LCRs of the received signal effect by multiple human bodies (N = 1, 2,..., 5) at 60 GHz. The simulation parameters are given in Table 1. Simulated AFD of the received signal effect by multiple human bodies (N = 1, 2,..., 5) at 60 GHz. The simulation parameters are given in Table 1.
where A s represents the maximal shadowing attenuation in dB, T s is the shadowing duration in seconds, t0 is the shadowing instance, and u is a model constant. 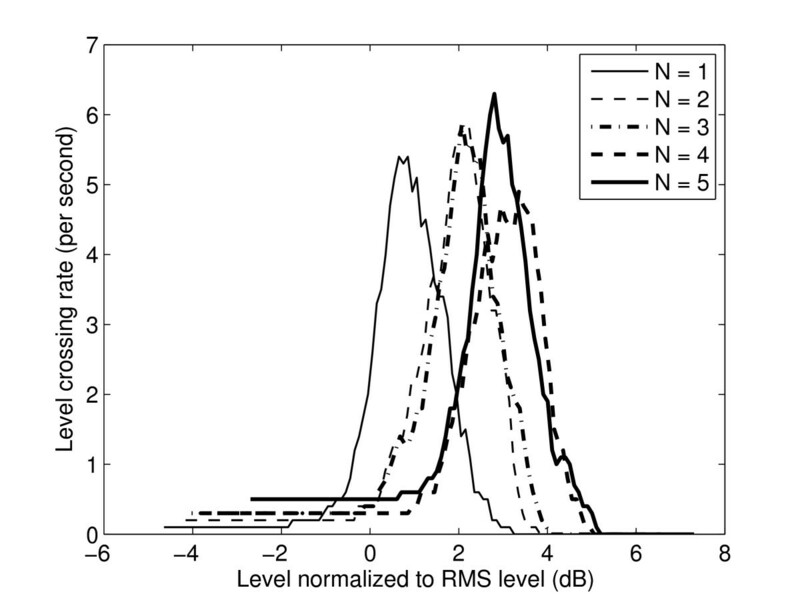 Figure 13 shows comparison of the direct signal component (large-scale fading) obtained using the empirical model given in Equation (14) and the one obtained using the proposed physical-statistical channel model at 3.35 GHz. Generally, we can observe that there is relatively good agreement between the two models. However, comparing to the empirical model given in Equation (14), the direct component of the physical-statistical channel model slightly oscillates due to the interference between the various unobstructed Fresnel zones. The same behavior can also be observed from measurement and numerical simulation (using MOM) results reported in . In general, there is relatively high similarity between the measurement and numerical simulation time series for human body effects reported in  (see e.g., [2, Figure 3]) and the ones generated using the developed physical-statistical channel model shown in Figure 13. In addition, the characteristics of the simulated first and second-order statistics of the physical-statistical channel model shown in Figures 7, 8, 9, 10, 11, and 12 are consistent with the ones observed from measurement results of human body effects reported in . 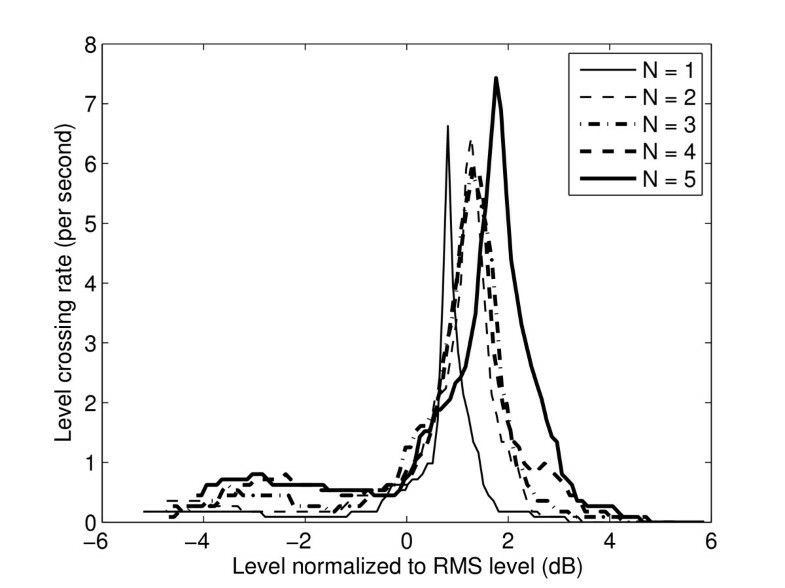 Comparison of the direct signal (large-scale fading) obtained using the empirical model given in Eq. (14) and the one obtained using the proposed physical-statistical model. The simulation parameters are given in Table 1 with N ^ = 1 , A s = 5.3 dB, t0 s, T s = 1.2 s and u = 1. In this section, an attempt has been made to initially validate the developed physical-statistical channel model using an empirical model for human body shadowing and reported measurement results. Further validation of the proposed model will be performed in the future as radio frequency (RF) measurements are made available. A novel physical-statistical generative model for signal effect by moving human bodies is developed. 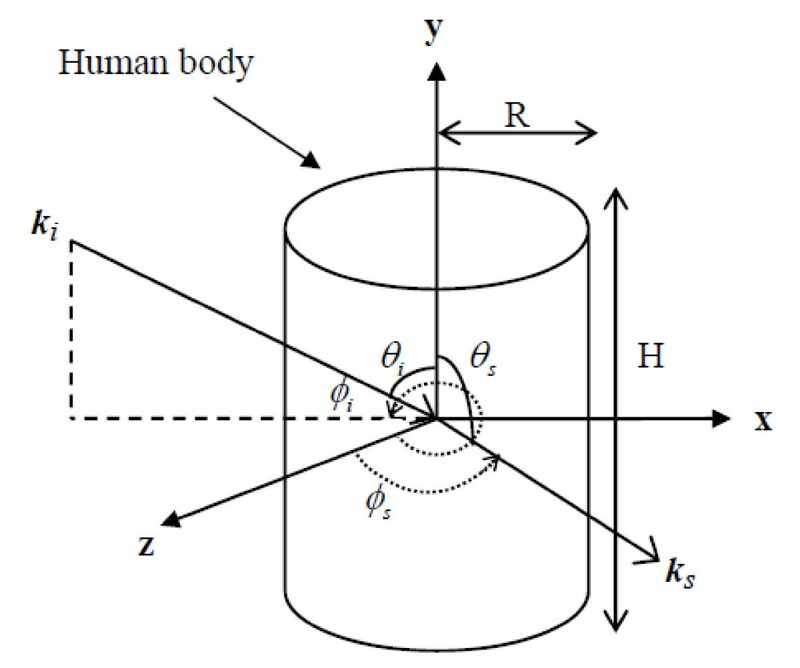 The human body is modeled as vertically oriented dielectric cylindrical volume. The received signal is assumed to be composed of a direct component which might be subject to shadowing and a multipath component due to reflection and diffuse scattering, i.e., a Ricean channel. The shadowing effect of the direct signal component is calculated using Kirchhoff diffraction equation. The multipath component is parameterized by calculating the reflected fields from the floor, ceiling and walls of the indoor environment as well as scattered fields from moving human bodies. The parameters of the Rice distribution thus change as the people walk thought the propagation environment. The shadowing and inter-shadowing events caused by multiple crossing of the LOS path are modeled using a Passion and Exponential distribution, respectively. 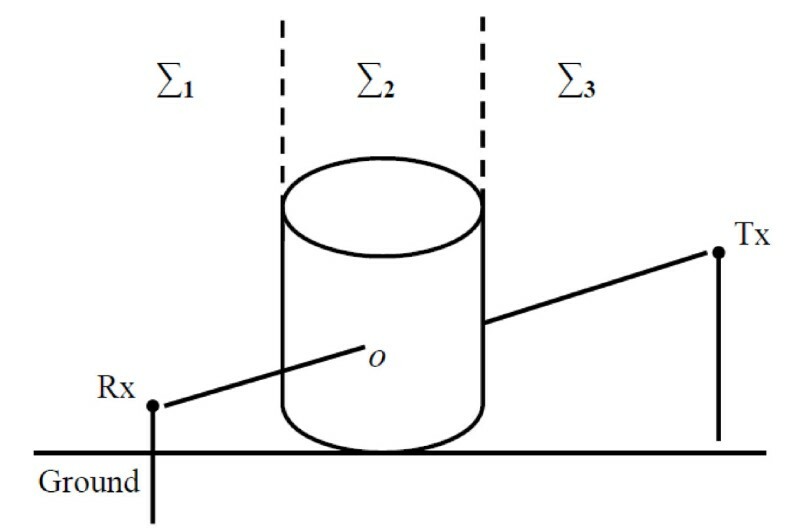 The physical-statistical approaches discussed are more effective for simulating large scenarios compared to complex physical models, and more accurate than merely empirical or statistical models as they take into account the geometry of the link, and rely on electromagnetic based methods for calculating the needed model parameters. 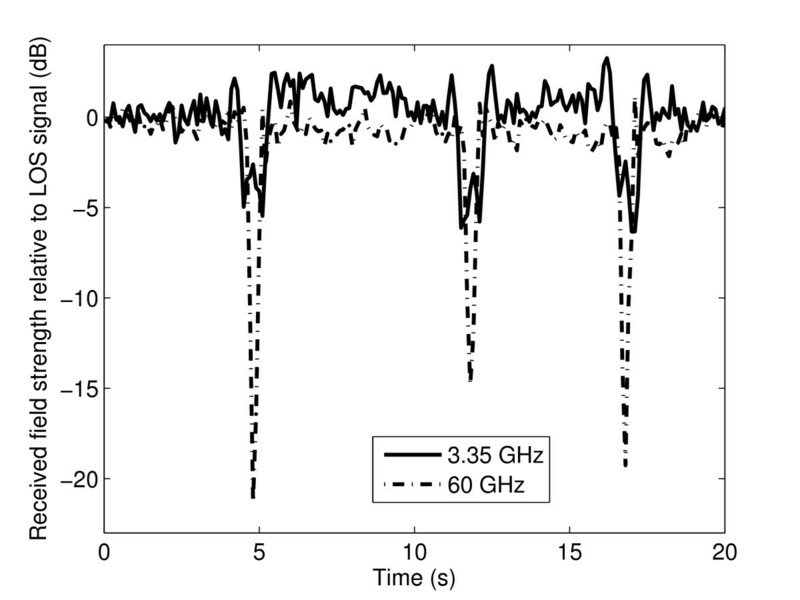 Furthermore, simulation results of the first and second order statistics of the received signal affected by moving human bodies for 3.35 GHz and 60 GHz signals are presented. 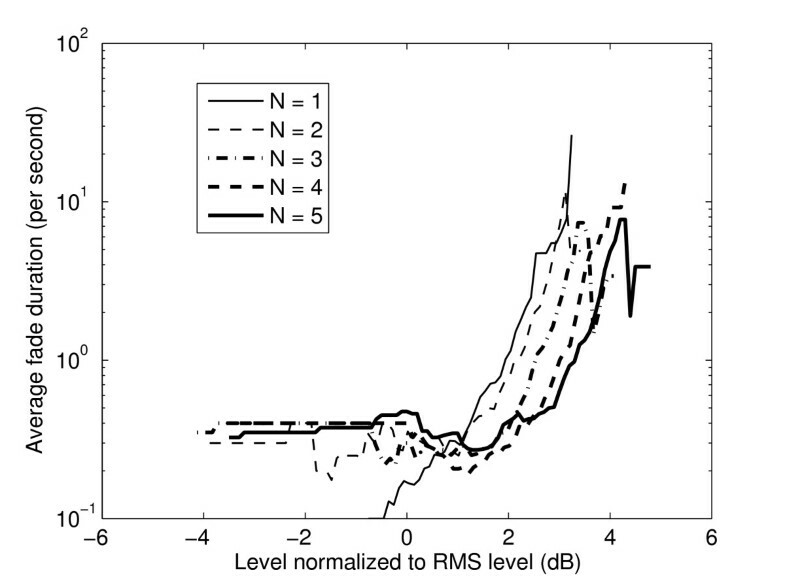 The results show that as the frequency increases the effect of moving human bodies on the first and second order statistics of the channel increases. Moreover, as the number of pedestrians increase, the slope of the CDFs of the received signal decreases proportionally. Similarly, as the number of pedestrians increase, the LCRs and AFDs of the received signal increases. An attempt has been made to initially validate the developed model using an empirical model for human body shadowing and reported measurement results. Further validation of the proposed model will be performed in the future as RF measurements are made available. In general, the proposed model can be used to generate time series of moving human body effects for indoor wireless access systems. This enables simulation of for example capacity-enhancing techniques such as route diversity, space-time coding and adaptive coding and modulation. The author would like to thank Gjøvik University College, Norway for supporting this study. This study was supported by Gjøvik University College, Norway.